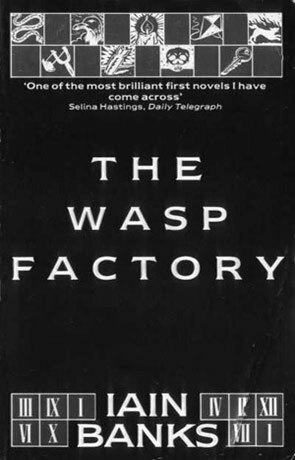 The Wasp Factory is the stunning debut of the British author Iain M Banks. Having read everything by Iain M. Banks and finding this book while browsing my brother's bookshelves, made for some hasty rearrangements of my to-read stack. Mostly the words "first novel" on the cover intrigued me - what could a younger Banks have to say? First novels have a tendency to be either, brilliant if a bit rough around the edges, or utter garbage, in which case the author is seldom heard from again, but that is another story. The Wasp Factory is about Frank and his life. Frank is a special kid or at least he has been since his accident. He isn't crazy, like his older brother Eric, who's a raving lunatic who has escaped from the asylum and is on his way home - only stopping to set fire to the occasional dog on the way. While waiting for Eric, Frank secures his island and tells us the story of his life and why he had to kill three people. Oh, and he feeds and prepares the wasp factory. Sounds strange don't it? Well, it is and I'm afraid that I can't really tell you much more than I already have without spoiling everything. As for being rough around the edges, well, not really, Banks writes beautifully, with the only weak part being Frank's father who I found a bit unexplained. Written on 1st September 2000 by TC.